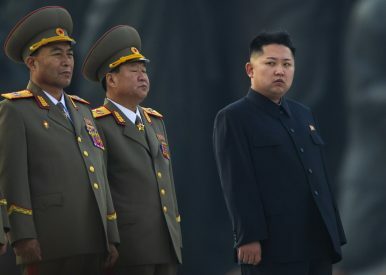 North Korean leader Kim Jong-un stands next to senior military leaders during a ceremony in Pyongyang (April 13, 2012). Is Myanmar Serious About Enforcing Sanctions on North Korea? Is this a real shift in North Korea-Myanmar relations, or just political expediency? During the 11th ASEAN Defense Ministers Meeting (ADMM) and 4th ADMM-Plus Meeting held earlier this week in the Philippines, the assembled ministers condemned North Korea’s ongoing missile and nuclear tests. In their Joint Statement, they expressed grave concern over escalating tensions on the Korean Peninsula and strongly urged Pyongyang to immediately comply with its obligations arising from all relevant UN Security Council Resolutions. This follows last Friday’s news that ASEAN member state Myanmar officially reported the expulsion of a blacklisted North Korean official from its territory, in line with several UNSC resolutions. These developments raise a larger question: Aside from whether or not North Korea complies with its obligations (which appears highly unlikely), will other members of the international community begin to more strenuously enforce UN sanctions against Pyongyang? Although the question is normally posed with China in mind, Myanmar is an interesting case insofar as Pyongyang and Naypyidaw have maintained notable, if uneven, ties over the years. The Government took necessary action against Mr. Kim Chol Nam, a national of the Democratic People’s Republic of Korea (DPRK) working as a Second Secretary at the Embassy of the DPRK in Yangon, Myanmar, who reportedly belonged to the Korea Mining Development Trading Corporation (KOMID), against which sanctions have been imposed by the United Nations Security Council. On 26 April 2017, the Embassy of the DPRK was notified to send him back, and accordingly he and his family left Myanmar on 9 June 2017. Myanmar took action in compliance with UN Security Council resolutions 2371, 2321, and 2270. Significantly, this is the first time Myanmar has ever submitted an implementation report in compliance with Security Council sanctions against Pyongyang. As NK News notes, KOMID is well known as one of the DPRK’s primary weapons dealers and has long been designated as an entity that evades sanctions. Kim Chol Nam’s role therein is consistent with Pyongyang’s use of diplomats overseas to carry out illicit and sanctioned activities. It is important to note, though, that Myanmar’s move occurred in a context of ongoing and increased U.S. pressure on its military, the Tatmadaw, to cut defense ties with North Korea. Previously, The Diplomat’s Prashanth Parameswaran described how U.S. pressure began under President Barack Obama. For instance, his administration designated specific individuals within Myanmar’s Directorate of Defense Industries (DDI), a massive state enterprise alleged to comprise more than two dozen arms factories and secret overseas bank accounts, and involved in the illegal arms trade from Pyongyang. In 2013, the United States blacklisted DDI’s then head, Thein Htay. Then, in 2016, the U.S. Treasury Department’s Office of Foreign Assets Control (OFAC) put Kim Sok Chol, then DPRK Ambassador to Myanmar, on the Specially Designated Nationals list for his own alleged involvement with KOMID. He was expelled from the country soon thereafter. The pressure has continued under President Donald Trump. In March of this year, DDI was once again sanctioned under the Iran, North Korea, and Syria Nonproliferation Act. Furthermore, on July 16, Ambassador Joseph Yun, U.S. special envoy for North Korea, visited Myanmar in order to seek assurances that Myanmar’s military was indeed breaking off all ties to Kim Jong-un’s regime. To the extent Myanmar’s recent actions signal acquiescence to U.S. pressure, it reflects a basic cost-benefit analysis. In short, further normalization of relations with Washington, which has been marked by the gradual unwinding of U.S. sanctions since 2012, is worth more than maintaining illicit and increasingly constrained ties with Pyongyang; even more so when the latter threatens to undermine the former. It remains to be seen whether or not the Trump administration will take any punitive action, including possible sanctions, against Myanmar’s military for its ethnic cleansing of Rohingya Muslims. Indeed, such a possibility may incentivize further cooperation on the part of Myanmar against North Korea. These near-term pressures notwithstanding, Myanmar’s more overt action against North Korean diplomats is significant in light of past ties between the two countries. In the 1960s and 70s, they maintained close diplomatic relations. Although the 1983 Rangoon bombing led Myanmar (then Burma) to cut all diplomatic ties, by the mid 1990s the new military junta was looking to reestablish contact. The junta’s violent rise to power in 1988 and rapacious internal rule had led to a harsh international sanctions regime, arms embargo, and international isolation. Pyongyang, an international pariah in its own right, was in need of new trade relations to mitigate the disastrous collapse in concessionary trade support from its Cold War superpower patrons, China and the Soviet Union. A barter agreement in the 1990s, whereby Myanmar traded rice, timber, and rubber in exchange for North Korean military equipment and technical assistance, led to the full reestablishment of relations in 2007. This occurred amidst even deeper military ties between the Tatmadaw and Korean People’s Army, reportedly including North Korean assistance in the construction of an extensive tunnel system beneath the newly constructed capital city of Naypyidaw as well as rumored support for Myanmar’s nascent nuclear weapons program. Apparently, Myanmar’s cooperation even extended to instructing local police, at the behest of North Korean diplomatic officials, to get street vendors to dispose of DVDs of the movie The Interview. Alleged nuclear cooperation is what led in 2009 to increased U.S. attention and pressure, and also the start of normalization between Washington and Naypyidaw. Normalization picked up steam in 2011, when Myanmar’s leaders began a process of internal transition away from military toward more civilian rule, bolstered by the 2015 elections and ascendance of Aung San Suu Kyi’s civilian-led National League for Democracy (NLD). Civilian officials understand improved ties with the U.S. and other countries, and the economic benefits that come with them, depend on further severing ties with Pyongyang. However, skepticism remains about whether or not the still powerful military leaders within Myanmar are as ready to dissolve such connections. Although one official called Myanmar-North Korea military-to-military ties a “marriage of convenience,” the opaque nature of those ties and decision-making in the Tatmadaw leaves the extent of the change open to question. While not the end of the story, Naypyidaw’s move to publicly acknowledge its implementation of UN sanctions against Pyongyang indicates a shift may be underway. Ben Young, Ph.D. candidate in history at George Washington University, notes: “Due to the 1983 Rangoon bombing, Burma, more than any other Southeast Asian country, knows the risks of hosting North Korean diplomats and officials on their soil and may finally be following a growing diplomatic consensus around the world that North Korean diplomats and officials abroad engage in rather nefarious activities and not diplomacy.” Pyongyang, which has already lost customers in the Middle East and elsewhere, may be losing yet another source of much needed currency. If so, Pyongyang’s already highly constrained position just got a bit tighter.